A unique art style in itself, the American traditional tattoo has long held its own in parlors across the country. Here are the 5 most common characteristics. Are you stuck choosing a tattoo? Then consider the American traditional category. 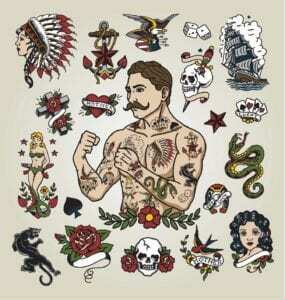 These tattoos have a visible presence in the world of ink, marked by specific themes and styles. Striking and meaningful, this type of tattoo might be the best for you. You might not be fully aware of everything this genre of tats has to offer. Even if you know about the traditional USA style, it’s worth reading a brief refresher. In a world with hundreds of potential tattoo designs, it’s important to know how to distinguish between the different choices. Here’s what you should know about American traditional. These tattoos are not for the faint-hearted. The images take an emotion or thought and push it to the maximum. Check out this example of a tattoo. When you see it, you can’t help but immediately recognize it: it’s a skull. What that skull means to you could change depending on your interpretation. But the point is that anything is on the table when you get a tattoo in this style: death, love, anger. They don’t always pay attention to the politeness of a situation. That doesn’t mean you can’t show happiness with these tattoos, or that you have to be dark. In fact, more explicitly happiness is often encouraged. The difference between these and skin ink images of a more abstract, flowery persuasion is their recognizability. They’re meant to look like something that the viewer will immediately recognize. The point is to reflect a reality in your life or in the world around you. Given how crystal clear the messages behind these tattoos can be, it makes sense that the genre tends to stick to a realist theme. One way to think about this point is to contrast other styles of tattoos. Think about this tattoo–what does it show? It’s not unrecognizable, but pizza with alien heads in it is a pretty unique idea, at least on this planet. An American traditional tattoo usually sticks to images that are more reflective of real things. That’s why flowers, snakes, and faces usually appear in a non-abstract way. Getting this kind of tattoo means you probably will choose an image that is in some way iconic or easily recognized by a viewer. That doesn’t mean the images always reflects something that looks exactly like a photograph. Often, this style is marked by a certain style of ink and design. Given the realist tendencies of these tattoos, it makes sense that they would be drawn with the sharp lines and contrasts that often define our world. These tattoos have clear cuts and curves. The detail of every image is striking–how else could you show resemblance to something in the real world? Check out how different these abstract tattoos seem from the average American traditional image. They’re not exactly confusing, but they seem to come from someone’s imagination, as opposed to their memories or sight. That doesn’t mean these tattoos are limited by a reality restriction. In fact, it’s allowed the genre to make its own styles. If you know a thing or two about tattoos, then you know there are a lot of color options on the table. When getting a new tattoo, you can choose everything from rainbow schemes to white ink. It makes sense that American traditional tattoos have carved out a unique spot along the color spectrum. Usually, these tattoos stick to a set group of colors: green, red, yellow, and a whole lot of black. Generally, you’re not going to see a wild move away from these colors. That selection doesn’t mean that these tattoos are boring. Oppositely, the similar color schemes of these images have forced people to come up with increasingly unique images over the years. That’s why, throughout history, these tattoos have been groundbreaking, both in the realm of tattoos and in culture in general. No matter what image you end up choosing, any image within this genre will stand out. There’s a rich history of tattoo pioneers within this genre changing the game for everyone else. Take Sailor Jerry, also known as Norman Keith Collins. Originally from Nevada, fifty years into his life he was settled in Hawaii and dolling out original tattoos to his customers. His legacy is printed all over this tattoo category. As time went on, he began to explore new frontiers of tattoos, earning a reputation for printing out unique images of importance on his customers. Some of those images nowadays that are associated with him include snakes, monkeys, and eagles. 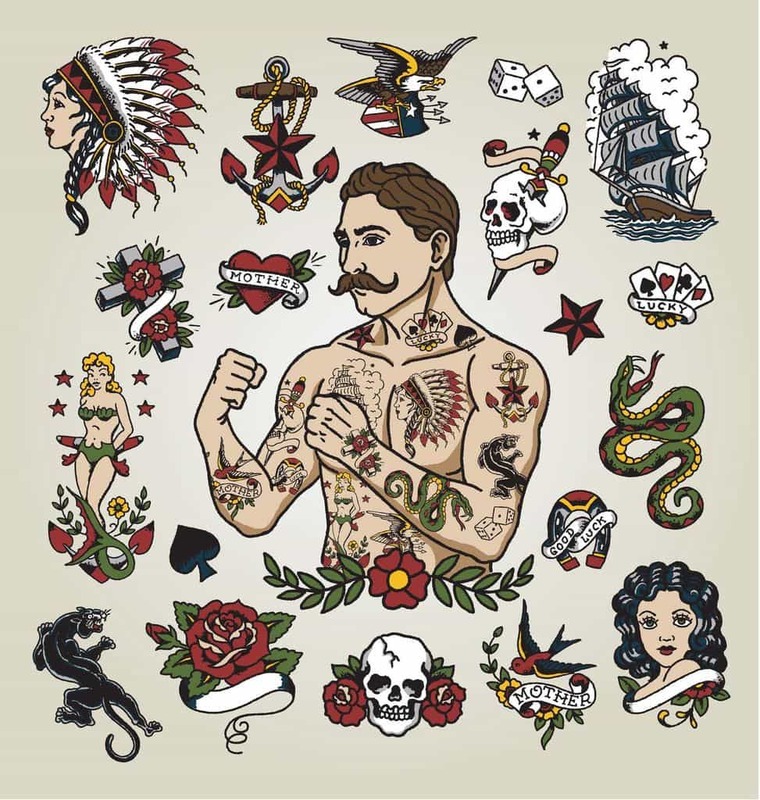 Sailor Jerry is just one of many tattoo pioneers who have learned this tattoo style and helped to spread it throughout the country and world. This style began with the popularization of tattoos in the U.S. in general, meaning its journey through time reflects American culture. It’s at once a representation of the fight to allow tattoos in American culture and a symbol of American culture itself. Its resistance or patriotism, depending on how you look at it–if not both at the same time. When you zoom out in that historical context, you understand the meaning of the American traditional tattoo that could potentially be on your body. Having an American traditional tattoo puts you in unique company in the world of tattoos. You could look at the situation from different perspectives. On the one hand, there is a wide range of celebrities who are tatted in the traditional American style. Have you seen Adam Levine’s tats? They’re a quite dense array of American ink. Knowing that Maroon Five’s singer has this brand of tat might float your boat. Or, it might make the whole thing less appealing. If you’re not into celebrity status, don’t worry–plenty of normal people have these tattoos, too. Looking for more information on your favorite tattoos? If you want more info or are looking to schedule an appointment, reach out to our team. We can help you out. You can pop by our Las Vegas Tattoo Shop, Henderson Tattoo Shop or Maui Tattoo Shop for more information and meet our artists.